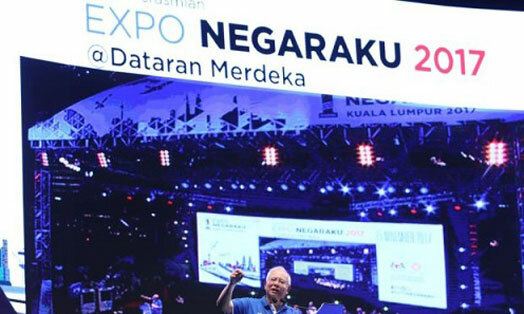 KUALA LUMPUR: Prime Minister Datuk Seri Najib Tun Razak on Wednesday launched the Expo Negaraku 2017, marking the start of a month-long exhibition at Dataran Merdeka. Organised by the Economic Planning Unit in the Prime Minister's Department and housed in five domed tents, the Expo aims to showcase the government's infrastructure projects around the country. The launch was also attended by the Prime Minister's wife Datin Seri Rosmah Mansor, several Cabinet ministers, and heads of government-linked companies and agencies. Among the exhibits are 3-D scale models of the future development of Kuala Lumpur including the upcoming PNB118 skyscraper. Visitors also have the opportunity to go through an interactive experience inside life-scale cars of the MRT, the upcoming East Coast Rail Link and High-Speed Rail (MyHSR) projects. Other interactive displays include the tunnelling processes for the Mass Rail Transit (MRT) projects. In his opening speech, the Prime Minister said that he received positive feedback from visitors who had viewed the exhibits earlier in the day. "I see this expo as the best approach for us to give citizens full information about our infrastructure projects, but at the same time, deliver a fun experience," said Najib. He added that the government would continue to deliver citizen-centred infrastructure projects. "If we can deliver the MRT, we can certainly do other projects, and this is not just omong-omong kosong (empty talk)," he added. Najib, his wife and other VIPs were given a tour of the exhibits following the launch. Various programmes and activities have also been lined up for the event throughout the four weeks, said Minister in the Prime Minister's Department Datuk Seri Abdul Rahman Dahlan. There will be light shows, mass zumba session, a futsal tournament and a fruit festival. Several food trucks were parked along the road leading to Dataran as part of the event, while artistes such as Qody Mentor and Daniel Lee entertained the crowd. Expo Negaraku will run from Nov 15 to Dec 15, from 10am to 10pm daily, at Dataran Merdeka in Kuala Lumpur. Entrance is free.